Care For the Homeless (CFH) will hold its fifth annual Summer Solstice Success Celebration in partnership with Broadway Community. 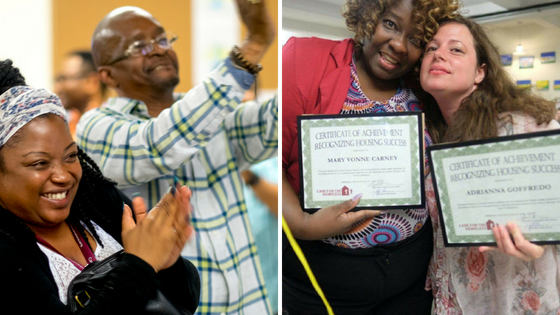 CFH will be recognizing the “success stories” of our clients who have overcome incredible obstacles while homeless. The celebration is set for Thursday, June 21th, at Broadway Presbyterian, 601 West 114th Street in Manhattan from 4:30 p.m. to 6 p.m. The event will recognize CFH clients who have overcome homelessness by obtaining and maintaining stable housing, overcome health obstacles and achieved success in advocating for better policies to fight, prevent and end homelessness. We will also recognize the CFH clinicians who have worked with our clients to achieve health successes. Join us for a celebration recognizing the success of our friends and neighbors. The celebration, featuring a meal and musical entertainment, is free and open to all. You can register here. For more information, please e-mail policy@cfhnyc.org.